There are reasons for using each. Are you trying to solve a problem or thinking of using these devices preemptively? Do you have a skimmer? If not ozone is a non subject. Huh??? One thing has nothing to do with the other IMO. A skimmer is not the only way to apply ozone. In fact, I personally prefer using an ozone reactor that has a carbon reactor plumbed in down stream in order to remove any residual ozone from the effluent. A properly designed ozone reactor allows for better control of ozone with greater contact time and can help insure that residual ozone is stripped from the effluent and air before it makes it into your tank and or home. That said, UV and ozone accomplish different things through completely different processes. While from a "visible" standpoint some of the results such as crystal clear water "looking" water may be similar, there are differences between the two devices and differences between what they accomplish with your water. I would strongly suggest reading up on the subject of the two. Both have their upsides and down sides and I think both have their place in aquaria however, before you even consider ozone, you need to know your ORP and measure over time with a properly calibrated ORP probe to get an idea of where your tank is at and what you are going to accomplish.. Ozone is not something you just dive into willy nilly. i am reading now, about uv so this article is wrong domorty? dan yes preemptively. so this is inaccurate ? Last edited by richiero; 10/14/2014 at 10:02 AM. He said UV does very little to combat disease which is true. If used at low flow rates it will kill parasites and other stuff in their free floating stages. It will improve water quality which in and of itself makes for a healthier environment which my aid to a minor extent is some disease prevention but on the whole, UV does very little in the way of disease prevention. It will only kill parasites and other bacteria while they are suspended in the water column. That said, you have to be running at the low end of the flow rating and at that flow rate, it will also kill copepods and other food sources for your livestock. Personally, I like UV filters and run them on all my systems. On fish only systems, I run them at low flow rates for parasite control. On my reef, I run it at a higher flow rate and use it primarily for water polishing as opposed to parasite control. That said, if you are going to purchase a UV filter, I strongly suggest getting a quality unit. There are two brands that come to mind. Emperor Aquatics and AquaUV. Personally, I prefer the AquaUV units and more particularly their Classic models. I'd also suggest getting one with a wiper as it reduces maintenance and allows you to keep the crystal sleeve clean. If you use the wiper on a weekly basis, the UV filter will run at optimal efficiency and the sleeve will remain clean. Be sure to size the UV properly for your system volume. AquaUV has some very good charts and information that will insure you get the right unit for you volume and goals while also helping you determine the proper flow for your goals. IMO low level use of ozone in either an ozone reactor or skimmer is quite effective at promoting water clarity and in skimmer actually makes the skimmer more effective. UV on the other hand, is not as effective for water quality, has no added benefit to skimming, and in a single tank set up is rather limited in effect on disease. Personally, I've never felt the need to use either in a reef. This is what I meant about if your not using a skimmer. i feel there is a lot of good info on that web site, on aqua uv's web site is says A UV Sterilizer is a proven method to eradicate bacteria, viruses and protozoa. why do they false advertise? and how could they? It's not that they false advertise. UV's can certainly play a helpful role in those areas but in order for anything to be eradicated, it has to be suspended in the water column and would have to pass through the UV sterilizer at a proper flow rate. In a reef tank where there are rocks, sand, corals, fish etc, the UV is more of a tool to help maintain a cleaner and more healthy environment but it's impossible to expect all water with those forms of life to pass through the UV as those forms of life will reside not only in the water column but on the fish, in the sand, within the rocks etc. Also keep in mind that much of what they are talking about is based on a fish only system in which the flow rates through the UV are at the low end for absolute sterilization or even in water purification systems for drinking water. In a reef tank, the low flow rates required to kill protozoans and other things, will also kill copepods and other life forms that we strive to maintain. As such, there is a trade off and many of us that use UV's in our reef tanks tend to run them at the higher flow rates in an effort to use them more for polishing water while also not killing off our pod population. Even so, the UV will have some impact on pods as well despite the high flow rates. Reality is that if we maintain a stable environment in our tank and employ good quarantine habits with preventative treatment, much of what you are worried about is really a non issue. A UV at a high flow rate will still help control bacterial blooms and can render many parasites sterile so they can't reproduce. A UV at the higher flow rates will also help maintain pristine water clarity, It's just that in a reef, you would likely want a higher flow rate through the UV so that you are not killing everything that passes through it and even at lower flow rates, you have to have realistic expectations. That said, as I mentioned, a UV will only kill what passes through it. Many parasites reside on a fish or elsewhere in our tanks where they continue to reproduce and may never come in contact with the UV filter. Bacterial infections in fish will remain in the fish and a UV filter won't do any good in those instances as well. Same goes with Ich which has different stages in it's cycle. One is what we see on the fish in the form of the white spots. It then falls off at which point it is in the water column for a very short amount of time before it settles into the substrate until the cycle repeats itself. As such, the UV filter will not eradicate it as a very small percentage of ich in it's free floating stage will even make it though the UV. The UV will (depending on the flow rate) kill some of it but not all of it. 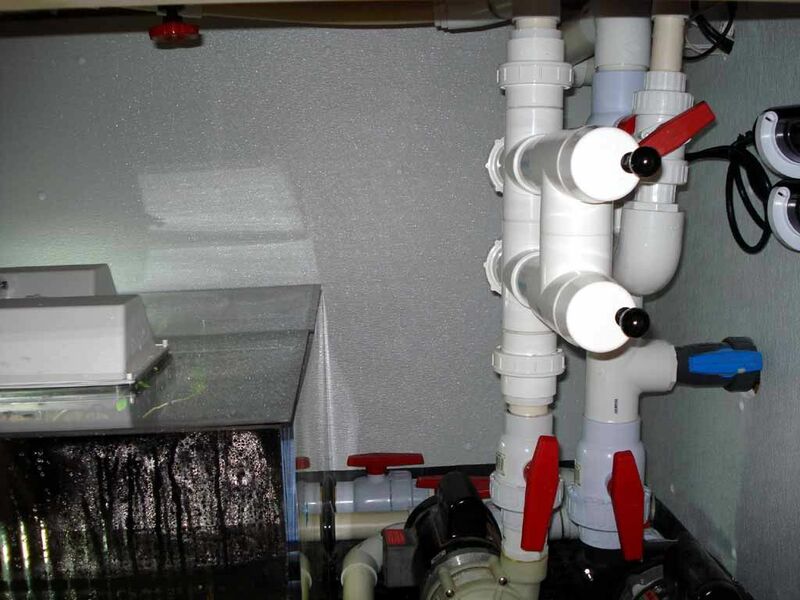 As such, a UV filter in an aquarium can play a role in a cleaner system that is less likely to have parasitic or bacterial issues but it is in no way an end all be all for those problems unlike a sterile and contained environment such as a water filtration plant where all water is continually filtered though the UV. In that case, the impact of the UV filter is much greater and the results and impact are obviously more definitive. Last edited by slief; 10/14/2014 at 01:04 PM. IMO low level use of ozone in either an ozone reactor or skimmer is quite effective at promoting water clarity and in skimmer actually makes the skimmer more effective. IME, ozone will cause a decrease in skimmate production. Not sure exactly why but the theory is that ozone breaks down the organics to a point where can no longer be bound to the surface of the bubbles, but in turn are now able to be consumed by bacteria where they couldn't before ozone use. Photos taken with a Nikon D750 or Leica M.
Either is an excellent water clarifier. Neither will prevent parasites. I have UV on my pond, and run a low level of ozone on my aquaria. thx for the info everyone. I agree. His units don't look very good either. I guess he needs to create white papers to help market his products too. This guy sure needs a lot of fluff to sell UV units. Unlike Tropical Marine Centre, AquaUV while more expensive has a great distribution network and a great reputation. You can get AquaUV parts from nearly every reputable on line retailer across the country. If you need bulbs, seals or o-rings, companies like Marine Depot have them on hand. AquaUV backs their products with great direct support too unlike Tropical Marine Centre. While AquaUV is not the cheapest UV on the market, like the link you provided say, they are quality units with great dwell time. What they fail to mention is their great support. Same can be said about Emperor Aquatics. Something that is non existent with Tropical Marine Centre who is over seas and depends exclusively on retailers for support. That said, the units mentioned in your links are cheap units meant to appeal the masses. Not necessarily quality units and they don't have the same kind of dwell time as the higher end units from AquaUV or Emperor. I happen to be very familiar with their products and used to run a Tropical Marine Centre UV unit back when their only UV's were their quality ones. I ran that unit for nearly 10 years but unfortunately, it's nothing like their standard low end products that are currently being pushed to compete with products like the Coralife Twist. If you are going to get yourself a UV unit, it's great that you are doing some homework but I would strongly suggest you talk to the folks at AquaUV. If you continue your research here, you will find that there is very good reason why companies like AquaUV and Emperor Aquatics are considered to be the best in the business. Personally, I prefer AquaUV and that happens to be what most of us who run UV's prefer. I've had several of their units over the years and they were all well made and reliable additions to my systems. 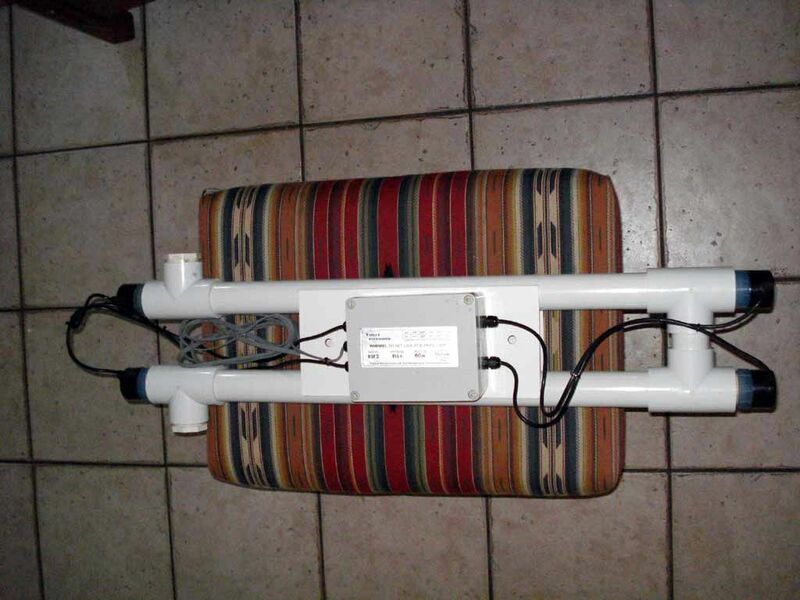 Here is the Tropical Marine Centre UV unit that I used to run on my tank. At the time, it was one of the only higher wattage units out there that used a crystal sleeve. These units are now relegated to Tropical Marine Centre's commercial product line and not readily available in the states. 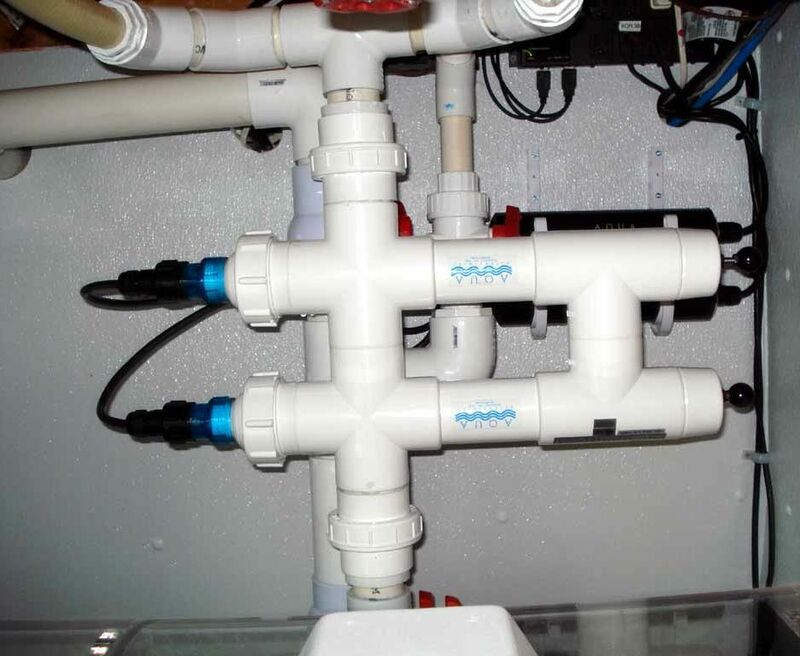 The AquaUV's equivalent (Classic Series) is better made, easier to service and backed by much better support. The comparable AquaUV is also much cheaper. But does sell them, and is trying awfully hard to the make them out to the be best thing since sliced bread. While they can indeed be useful in some circumstances, they are not the wonder equipment with all the attributes he gives them. How much space do you need? The AquaUV's are pretty compact. The 15 watt would probably be OK but the 25 watt would probably be best. It's only 20" long with the wiper and can be mounted in any orientation. Here is a link to the measurements of their different UV's. If you have the room for the wiper version, I would suggest going that route but you need room to pull the wiper in and out. On my office tank, I've got one mounted parallel to the underside of the tank framing in a horizontal orientation. 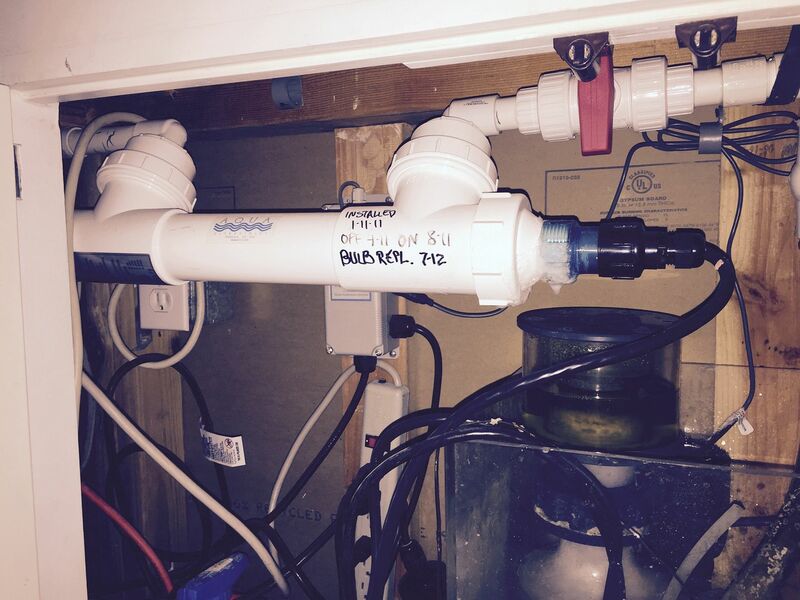 On my 500 gallon home tank, I have a 114 watt unit mounted directly to the pumps output. UV reduces that chance of external bacterial infection rather well. I feel naked without my UV when Qting for the first several weeks. There is a great deal in the classified section for a 25 watt AquaUV Classic with the wiper and a new bulb. Don't forget, there are Emperor UV units that are really rock solid. They AquaUV and Emperor can be found for relatively inexpensive costs on ebay also.